It’s the lake of dreams. 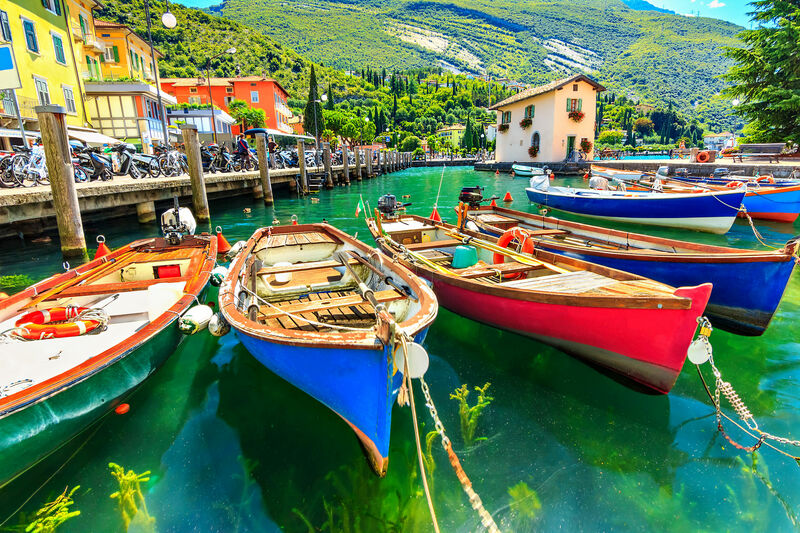 Lake Garda (Lago di Garda) is the largest lake in Italy, and a popular destination for travelers searching for deep blue transparent waters, wind-in-your-hair yachting, and la dolce vida the area is known for. The rich and famous may head for the northern resorts towns of Riva del Garda and Torbole, while families and backpackers head for the farmhouses of Bardolino, Castelnuovo del Garda, or the fortified town of Sirmione in the south. Formed by the movement of glaciers thousands of years ago, Lake Garda is tucked between the regions of Veneto, Trentino, and Lombardy. Its upper half, shaped somewhat like the handle of an axe, reaches into the Italian Alps, while the southern section, shaped like the blade of the axe, stretches down into an undulating plain. Such a shape is typical of a moraine (glacier-formed) valley. The lake is 32 miles (51 km) long from north to south, and about 10 miles wide at its widest point. In addition to lovely towns, ferry boats, orange orchards, and olive groves, the shores of Lake Garda are host to a variety of vineyards, which including several DOCs and one DOCG. 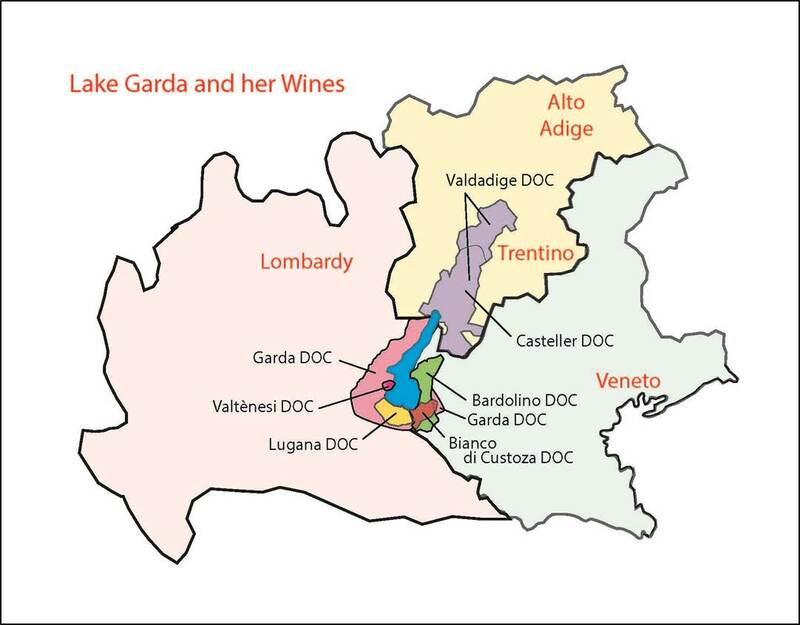 These wines of Lake Garda are briefly discussed below, beginning in the northern end of the lake (tucked into Trentino), and following around the lake clockwise through Vento and ending up in Lombardy. These regions are overwhelmingly overlapping, interlocking, discontiguous, and straddling the boundary lines of cities, towns and regions–and this little article is but an overview. It might be a good time to book a trip to any (or all) of these lovely wine regions. Valdadige DOC: The Valdadige DOC (also known as Etschtaler, particularly among the German-speaking denizens of the area) is the only DOC that stretches across parts of both the Trentino and Alto-Adige provinces. The DOC covers a wide range of wines—including white, red, rosé, still, semi-sparkling, varietal, and blend. A typical Valdadige Bianco DOC will be based on Pinot Bianco, Pinot Grigio, Riesling Italico, Muller Thurgau, or Chardonnay, with a range of other typical white grapes of the region also allowed. Valdadige Rosso or Rosato DOC is produced using a minimum of 50% Lambrusco a Foglia Frastagliata (Enantio) and/or Schiava (plus a plethora of allowed red varieties). Varietal versions of Pinot Grigio, Pinot Bianco, Chardonnay, and Schiava may also be produced. Frizzante wines may be either dry or semi-sweet, and may be produced from Pinot Bianco or Chardonnay. Casteller DOC: The Casteller DOC covers a large area across the middle of the Trentino province and overlaps a portion of the larger Valdadige DOC at the north end of Lake Garda. Casteller is a red wine-only region known for soft red wines based on a minimum of 50% Merlot; the remainder may be filled in with Schiava (Grossa or Gentile), Lambrusco a Foglia Frastagliata (Enantio), Lagrein, or Teroldego. 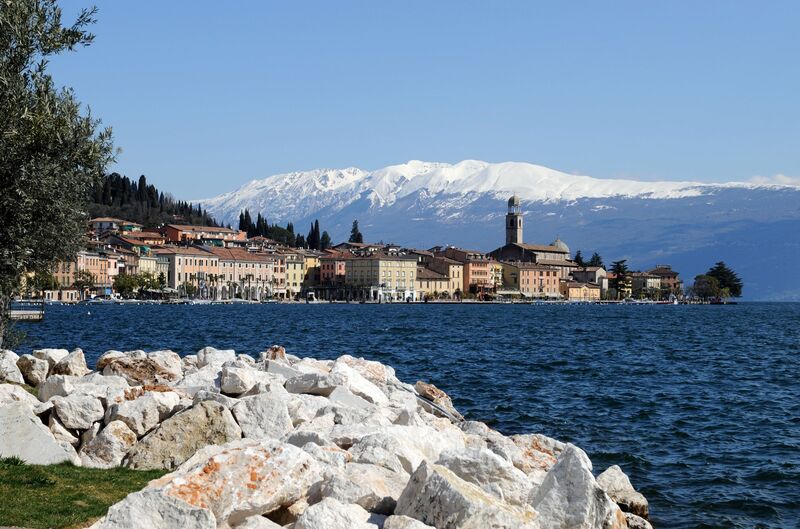 Bardolino DOC (and her sisters): Veneto’s Bardolino is undoubtedly the most famous of the Lake Garda lakeside DOCs (and even includes a DOCG, the Bardolino Superiore DOCG). Bardolino produces mainly red wines and some rosé (a much-beloved Chiaretto) from a blend based on 35–80% Corvina Veronese grapes (a portion of which may be replaced by Corvinone). Small amounts of Rondinella are required, and small amounts of Molinara, Rossignola (Gropello), Barbera, Sangiovese, and Garganega are allowed. The Bardolino DOC allows for the production of many versions. Reds may be produced as a classico, novello, or classico novello in addition to the normale versions, and the chiaretto (rosé) may be released as normale, classico, or sparkling. Bardolino is known to be a medium-bodied, fresh-tasting red wine. The Crovina base lends delightful sour-cherry aromas and flavors in addition to floral, herbal, and ripe berry notes. Novello versions have been compared to Beaujolais Nouveau and rosé versions are fresh, fruity, crisp and lively. I like to describe Bardolino Chiaretto like “red Bardolino with its shirt off.” I’ve never had the spumante version, but I’m on the lookout now. Bianco di Custoza DOC: The Bianco di Custoza DOC, tucked below Lake Garda on her southwest side, is located within the Veneto region. The DOC overlaps with the Bardolino DOC quite a bit, but also extends past the boundaries of Bardolino a bit as well. Bianco di Custoza, sometimes simply called “Custoza,” is a white-wine only DOC, but does allow for sparkling wine, sweet wines made via the passito method, and a superiore version, in addition to the normale dry, still wines. All of these versions of Bianco di Custoza may be made using the same palette of grape varieties–but from there things get a bit complicated. The basis of the wine starts out with at least 20% (and a maximum of 40%) Garganega. Next, it includes a minimum of 10% (and a maximum of 40%) Trebbiano Toscana (otherwise known as Ugni Blanc). Another 5% to 30% is an interesting grape known as Trebbianello, which is a local clone of the grape alternatively known as Tai or Friulano. Other grapes that are allowed in varying amounts include Bianca Fernanda (a local clone of Cortese), Malvasia, Riesling Italico, Pinot Bianco, Chardonnay, and Manzoni Bianco. Lugana DOC: The Lugana DOC straddles the Lombardy–Veneto border at the southern edge of Lake Garda. The name Lugana is as picturesque as its surroundings; the word is derived from the Latin for “Lake in the Woods,” reflecting the dense woodlands that existed here not-so-long ago. Lugana is a white wine-only DOC, producing wines in a range of styles from a minimum of 90% Trebbiano di Lugana grapes. The Trebbiano di Lugana variety is also known as Trebbiano di Soave, Turbiana, or Verdicchio Bianco. The DOC produces mainly fragrant, dry white wines (often compared to Soave in style), and also allows for superiore, riserva, late-harvest, and sparling versions. Valtènesi DOC: Located in Lombardy’s Brescia province, the Valtènesi DOC produces both red and rosé (chiaretto) wines based on a minimum of 50% Groppello (Gentile and/or Mocasina). The remainder of the blend may include any of the red wines approved for use in Lombardy, with Sangiovese, Marzemino, and Barbera most often used. The Groppello grape is native to this area of northern Italy, and is grown in very small amounts, mainly in Lombardy and Veneto (where it may be known as Rossignola). 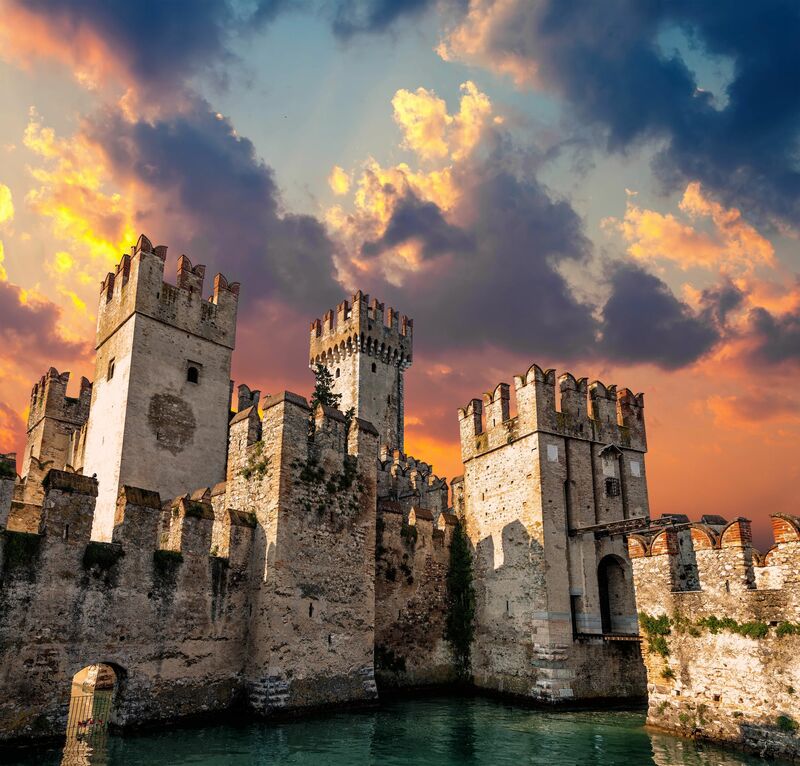 Garda DOC (and the rest of the Garda family): The Garda DOC extends along the western shore of Lake Garda (in Lombardy), and continues on to the Veneto side, overlapping portions of the Lugana, Bardolino, and Bianco di Custoza DOCs along the way. 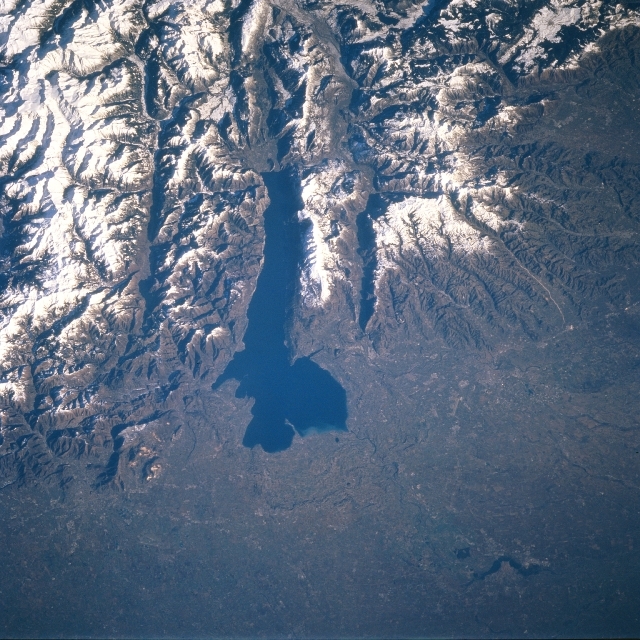 Two small portions on the Lombardy side overlap with smaller Garda DOCs: Garda Colli Mantovani DOC overlaps a small section at the southern end of the lake, and a small section near the northern edge overlaps with the Garda Bresciano DOC. All of these regions produce a wide range of wines, including red, white, rosé, sparkling and novello versions, from a range of grapes representing the typical varieties of the area.